The power print holds is not to be underestimated, especially when you create works that spread a positive message. Our Job of the Month showcases one of our customers creative style and supportive hearts, with the help of the digital press. The color we all relate to this cause is pink and it immediately registers with the world as a sign of support. 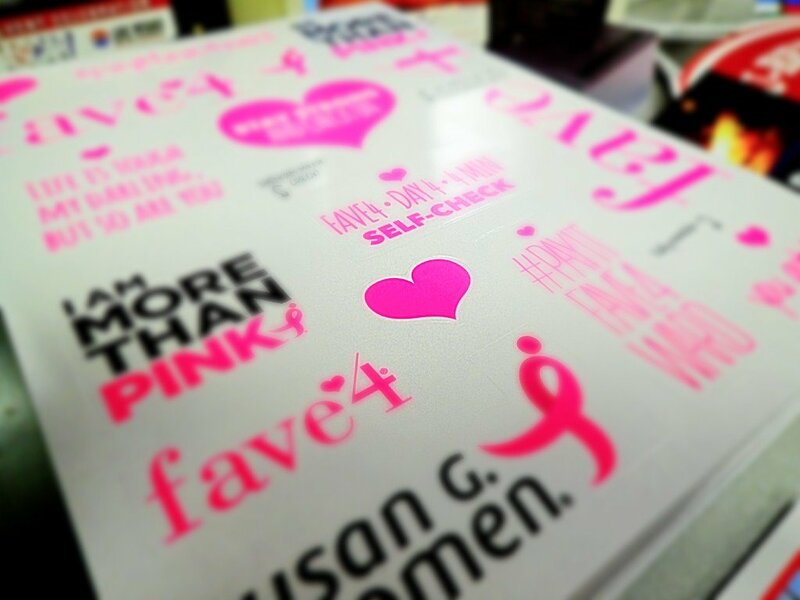 Our customer was wanting to show support for the Susan G. Komen foundation by creating clear clings that would be placed on windows, walls and hair spray cans. The color had to be vibrant so naturally, the florescent ink from HP allowed our digital press to showcase it in all of its vibrance. We are happy to have the opportunity to help a business support such a worthy cause and always cherish being able to assist in spreading a positive message. Thanks again and keep fighting the good fight! #Voomie of October – Sheryl Koppa Voomies, Mount Up !